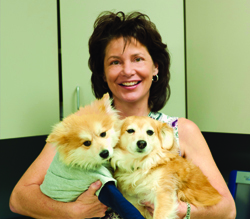 Dr. Ward earned her DVM Degree from The Ohio State University in 1989. She performed an internship in small animal medicine and surgery at Veterinary Specialists of Connecticut in 1989-1990, a residency in Small Animal Medicine at the University of Florida College of Veterinary Medicine in 1990-1992 and completed a second residency in Medical Oncology at The Ohio State University College of Veterinary Medicine in1994. She was a clinical assistant professor in the small animal internal medicine service at the Ohio state University College of Veterinary Medicine for three years and worked within the internal medicine department of Med Vet in Columbus, Ohio for 1 year prior to moving to Florida in 1998. She currently works at Gulfcoast Veterinary Oncology and Internal Medicine in Sarasota, Florida and sees patients in Naples and Fort Myers on Wednesdays.